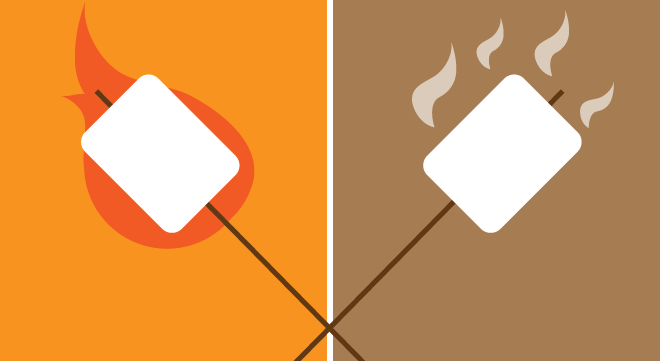 This week’s Outdoors Issue inspired our latest entirely unscientific food preference poll: What’s your s’more style — marshmallow carefully toasted or intentionally engulfed in flame? A reminder, first of all, that if you have intentions to go make s’mores around a rustic campfire somewhere in the Inland Northwest this summer, check for burn bans and fire rules first. Now, the results: Maybe it’s impatience or maybe we just enjoy setting things on fire, but the majority of comments were in favor of marshmallows purposely set ablaze. A number of commenters volunteered a preference for the other ingredients, too, with suggestions of Oreos instead of graham crackers and the addition of Nutella. Mr. Goodbar was suggested as a chocolate of choice, but the most frequent recommendation was to use a Reese’s peanut butter cup as the chocolate layer. Depends on the wine you are having. A nice late harvest Semillon made dry likes the golden brown version with a milk chocolate bar. Same with a Cab. Sauv. but change the chocolate to a darker bar, even for some very tannic CS’s bittersweet is the call. Burn it and you are in Cab Franc country all the way. We've previously tallied responses on hot vs. iced coffee, leftover pizza and favorite fries condiment from Zip's. Speaking of Food , For Fun!